Owen Wilson plays Gil Pender, a Hollywood screenwriter and aspiring novelist, in this Woody Allen film. Gil is on vacation in Paris with his fiancée, Inez (Rachel McAdams), and finds himself mysteriously transported to 1920s Paris one night when, wandering lost in the streets, a car drives up and the people inside – all dressed in 1920s fashion – invite him to join them. Gil makes this nightly trip into the 1920s and he meets meet plenty of famous names in the arts, such as F. Scott Fitzgerald (Tom Hiddleston), Ernest Hemingway (Corey Stoll), Gertrude Stein (Kathy Bates), Pablo Picasso (Marcial di Fonzo Bo), and Surrealist figures Salvador Dali (Adrien Brody, who is really funny here), and Luis Buñuel (Adrien de Van). But even as Gil enjoys these experiences, it drives a wedge ever deeper between himself and Inez, who was already growing distant and was having an affair with someone else. 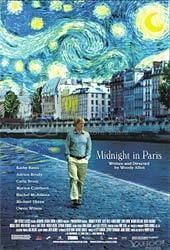 I liked Midnight in Paris better than I expected. Things I’d read and heard about Woody Allen films never made me very interested in them somehow. But this was amusing and rather charming, even though I didn’t like the lead characters (Gil, Inez and Adriana – played by Marion Cotillard) very much. I put the charm down to the entertaining minor characters and the music and the production design. The Cole Porter music was delightful, and so were the other instrumental pieces throughout – it was all very “Paris in spring” to me. The visuals were lovely. I liked the opening montage of scenes from Paris and it really makes a difference when you can recognise places you’ve been to. However, I could have done with a little less of the yellow tint over the whole movie, though it fit most of the 1920s scenes quite well with all the warm lighting around. The minor characters were fun to watch. The three Surrealists, the painter Dali, filmmaker Buñuel and photographer/painter Man Ray (Tom Cordier), produced an absolutely hilarious scene when Gil chose to tell them that he was a man from the future. Man Ray: A man in love with a woman from a different era. I see a photograph! Luis Buñuel: I see a film! Gil: I see an insurmountable problem. Salvador Dalí: I see… a rhinoceros! The whole rhinoceros thing was just so funny. And look, I found the whole scene on Youtube! But if it wasn’t for the amusing side characters and the pleasant music (and my curiosity to see Tom Hiddleston as F. Scott Fitzgerald) I would probably have skipped many bits in this movie. It was kinda predictable. I could tell from the start that Gil would not marry Inez in the end, and when Adriana started talking about being the type who loves nostalgia too it started to feel like he wasn’t going to end up with her either; and once the girl at the shop was introduced into the story, there was a moment when I thought, “Ah, he’ll probably end up with her instead of Inez or Adriana.” And that was exactly what happened. Still, pretty images, delightful music and fun side characters. A good watch, even if the central story was predictable.